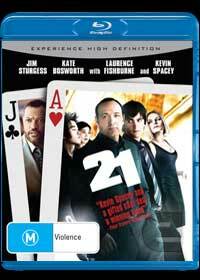 Based on a true story, 21 is the tale of a student who is reluctantly drawn into the world of illegal card counting in this entertaining drama movie. The main character is Ben (Jim Sturgess), a brilliant student at M.I.T who has a desire to attend Harvard Medical School, however the cost of attending is in excess of $300,000. His only hope is to gain a scholarship, however with 70 other students, he needs to impress the interviewer... somehow. By luck or method, Ben is under the watchful eye of Micky Rosa (Kevin Spacey), one of his professors who believes his talent can benefit the underground card counting "club" that he runs. This "club" is composed of other MIT students who through Rosa's tutelage, have created the perfect card counting system and fly to Vegas every weekend to make a plethora of cash. Eventually Ben reluctantly agrees to take part in the endeavor so that he can use his winnings to help finance his way through medical school. However as Ben stars to win, his shy and endearing personality stars to disolve as he lives the high life and things start to go astray as relationships are questioned and the "club" is soon under the watchful eye of the Casino that they are trying to count. Without spoiling the movie any further, 21 is quite an entertaining film, although predictable at times will leave most viewers glued to their screens. It features some exceptional acting by Sturgess, Spacey and Kate Bosworth which makes this one of the better drama movies of the year. Amazing Blu-ray video and audio quality, 21 is almost a movie-like experience and match that with some extraordinary special features such as the commentary with director Robert Lukitic and even the ability to play 21, this is the perfect compendium for those enjoyed the movie the first time around or for those looking for a gripping drama movie.